I would love to watch this again. It is unusual on SO many levels! A movie where the spoilers tell you how it begins. In my top 10-ish list (if not 5-ish). First saw this on the strength of Moss's then-recent role as Trinity in 'The Matrix' and hate-liking* Guy Pierce for some reason it exceeded my expectations. Shortly after seeing this, I came across a remixed version which re-edited the scenes so that everything was in forward chronological order and it amped the pathos up to 11 from the original 10. Ultimately, it's a supremely tragic story for me because the underlying injustice/ anger can never be slaked, and every relief from pain (from enacting revenge) is short lived and never remembered. One of those rare movies that is so much more than its central gimmick. Very rewatch able. IIRC this was an alternate version featured on a DVD release? (Having checked Wikipedia it was only on the UK DVD). Supposedly, on the release that I have (in the US), if you complete the psychiatric exam by selecting the right objects in the right order, the chronological version is unlocked. I've never tested it. Interesting about the re-edit, I'd read that it ruined the drama and effect of the story. But doubt I could ever pass that test, so moot. I have the (US) DVD version with the psych evaluation! That's the whole UI and it's pretty weird. "How does this picture make you feel?" "Nervous." "Ok, here's the director's commentary!" There's one where they ask you to arrange a series of pictures in chronological order. If you do it backwards, you get to watch the movie chronologically. That also means all the black and white segments in the hotel room are stitched together, too. It's certainly not as good a movie that way, but it's still quite good. You know how sometimes really, really smart people have kind of a weird inability to do a particular normal thing, like somehow the smartness took advantage of their mental plasticity and invaded the part of their brain responsible for their sense of direction, or remembering where they left their keys or whatever? Like Sherlock Holmes getting angry because someone told him about the heliocentric model of the solar system, and he thought the information was useless and would take up space in his head? So, I have a really smart friend who for whatever reason is unable / unwilling to understand flashbacks in movies. She has a PhD, sure, and can do long division in her head and is a front desk violinist, uh huh, but she just doesn’t get the narrative convention that when a character says “hey, remember back in 1974, when...” and the screen goes wavy and switches from colour to sepia, and all the actors are wearing clothes from several decades previously and have different hairstyles, that’s the director signalling hey guys, now we’re in the past relative to when the main story takes place. She just can’t follow. Baffled. 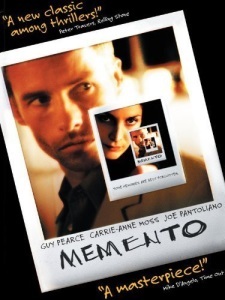 Anyway, this is a roundabout way of saying that I made her watch Memento once and she’s never forgiven me. Yeah the UK DVD also has the same easter egg where you can watch the film forwards, but as Sibrax says all the black and white scenes are together, and the pacing is basically dead. But a very good film in the "right" order. Fun times on a rewatch when you spot the replacement of Sammy with Leonard for a split second, making explicit that this story is how his wife really died. I hadn't rewatched this movie since it came out. And I'm amazed at how well it holds up. The conceit of cutting up a movie like this should make it hard to get into. Unwatchable high art. But it's very engaging even when you don't understand it all yet. Also the philosophical implications (what's the meaning of actions when you don't remember them, ...) aren't ponderous at all. So much better than Inception. There's a youtube video of Christopher Nolan explaining the narrative structure of the movie, it's mostly interesting but a little pompous like any creative-type speaking about their art. The wikipedia article also has it diagrammed. When the movie is stitched together sequentially, what I noticed in the black and white scenes is how effectively the camera work portrays Leonard's psychology. The camera is usually a little too close to Guy Pearce's (his name is spelled wrong in the tags!) face for comfort, he's confined and pacing in the hotel room making you feel like both you and him are trapped in his head. The Sammy Jankis flashbacks are a relief to watch, hinting that this is just a story that Leonard tells himself to feel better. The pacing is killed, but it created an unsettling effect that emphasizes that Leonard is an untrustworthy narrator.